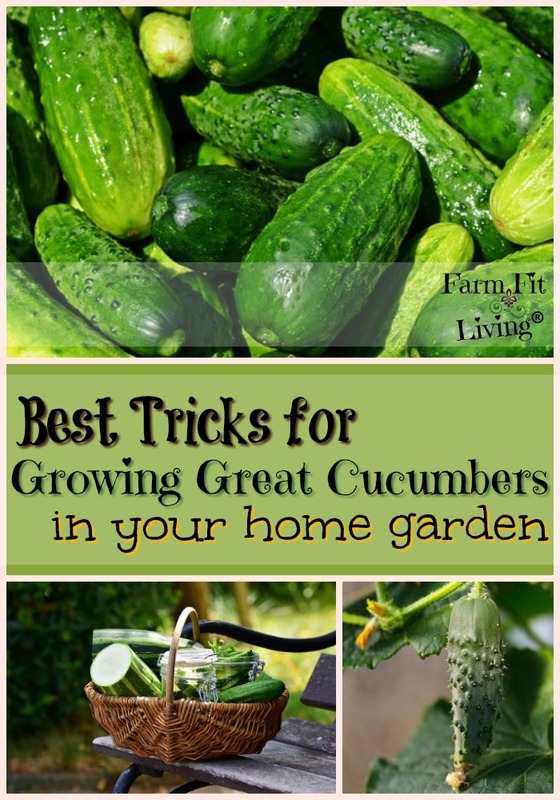 Looking for the best tricks for growing great cucumbers wherever you are? No matter where you are, you can grow cucumbers. If you have a large amount of space or a small space, cucumbers can be easily grown vertically with a trellis to save on space. There’s so many great things about cucumbers! 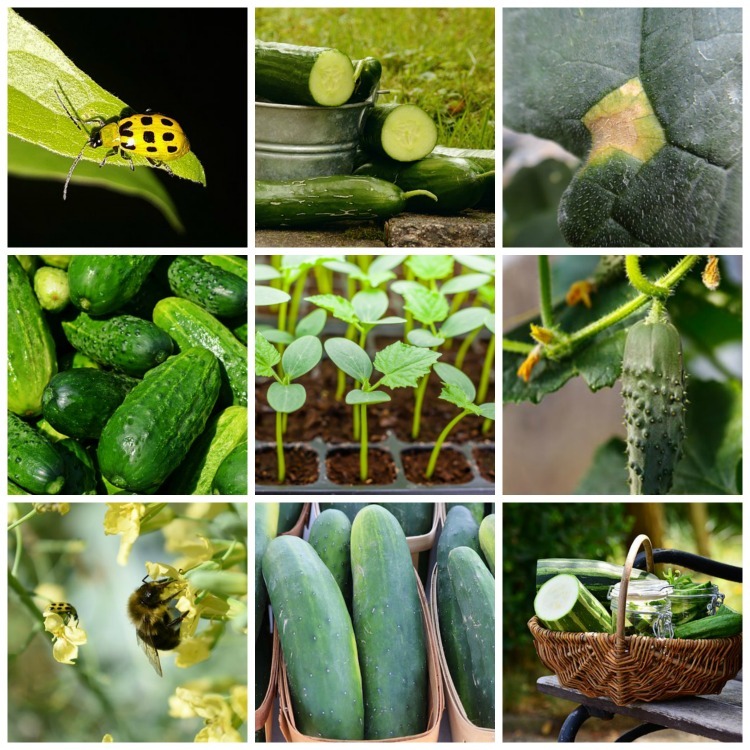 I want to help you to grow better and more delicious cucumbers yourself. Introduce some secrets to growing cucumbers. Explain some cucumber plant problems you might face. Give you my best tricks for growing great cucumbers. How do you choose which one to go with? Well, simply put, go ahead and choose a variety that will produce the characteristics you prefer. The most popular novelty variety is called the Lemon Cucumber and produces round yellow fruit resembling a lemon. Whichever variety you choose to grow, here’s the type of nutrient dense soil that any cucumber plant will love. What type of Soil do Cucumber Plants like? Cucumber plants need deep, well-drained soils that have an even mix of nitrogen, phosphorus and potassium. Before planting, it’s perfectly safe to apply 1-2 pounds of 10-10-10 or 12-12-12 per 100 square feet of garden area. After the vines are 10-12 inches long, side-dress a liquid fertilizer along the rows. This side-dress will help improve yields and summer vine vigor in the heat. It’s very important to note that cucumbers are a warm season crop. Soils must be at least 65 degrees F for cucumber seeds to germinate. If transplanting plants, be sure that all danger of frost is past. Maneuver soil to make “hills” spaced 5 feet a part. Plant 3-5 seeds per hill about 1 inch deep. Dwarf types can be grown in 3-foot rows with plants 2 feet a part. I enjoy getting early cucumbers, so I like growing cucumbers indoors under lights and transplanting them outside after danger of frost. You can start seeds 10 days to 2 weeks before you are ready to transplant them. I like using this black plastic mulch as a soil warmer and weed deter-ant. Then, burn holes into the plastic and dig a hole into the soil as deep and wide as your transplant root system. It’s very important not to damage the tap root when you plant these transplants. The #1 important thing to remember about cucumber plants is that they need to have beautiful, full canopy. Without plenty of full leaves to shade the cucumbers, you’ll have cucumbers that are sunburnt and of low quality. Cucumbers are fairly shallow rooted and require caution when weeding. I’ve mentioned the usage of black plastic. You can also control weeds by light scraping with a hoe. Watering the right way is also important. Put your sprinklers away. Ground irrigation using these soaker hoses will help keep the plants healthy and on track to produce high quality cucumbers. When vines are vigorously growing and starting to set fruit, they have the greatest requirement for water. However, too much watering can encourage foliar diseases of the plants, thus reducing the quality of the leaf canopy. Therefore, I’m a strong proponent of soaker hoses that will only water at the root level where it needs to be watered. This will reduce the amount of fungular issues on the leaves. Finally, healthy care of plants involve making the decision for growing cucumbers on trellis. Since cucumber plants are vines, they might be inclined to climb a fence or cage. This practice also helps with space. If you’re wanting to start your plants climbing up a trellis, you’ll have to get them started yourself for best results. I keep bees so that they can pollinate my vegetable crops. Cucumbers are examples of plants that need to be pollinated by bees. Did you know that cucumbers have separate male and female flowers on the same plant? Male flowers are predominate and usually appear before female flowers develop. But, healthy plants do develop both and pollinators, such as bees, are required to transfer pollen from male to female flowers for cucumbers to develop properly. Bees transfer pollen from the male flowers to the fruit-bearing female flowers. Poor pollination will result in misshapen or underdeveloped cucumbers. Both of these flower types are yellow, but female flowers have a miniature fruit at the base of the flower. This is because only the female flowers will develop fruit. Male flowers usually outnumber the female flowers. Pollination is probably one of my most favorite parts of growing a garden, especially cucumbers. I just love the flowers! They are so beautiful. They open up in the morning and early afternoon, when bees are most active. Knowing what time of day flowers open and close can help you control harmful insects as well. It’s important to avoid spraying any insecticides on the plants when the flowers are open. Therefore, avoid spraying early morning to late afternoon. If you must spray an insecticide to control a major problem, spray when the flowers are closed in the evening. This will allow you to control insects without harming beneficial insect pollinators. 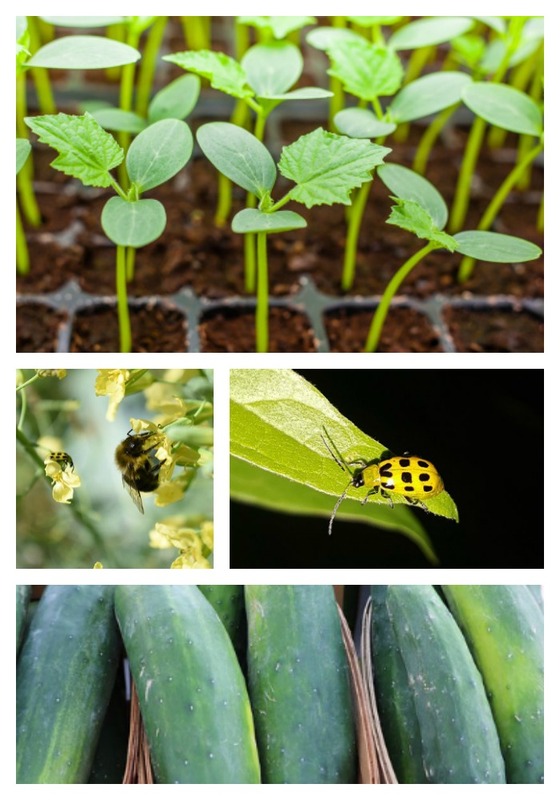 Some things to watch out for include insect damage and cucumber plant diseases. Let’s start with insects. Both of these beetles feed on the plants early in the season. They actually inject a bacteria that later causes the plants to wilt and die. Be on alert and destroy immediately. One insecticide that will work great to control these beetles is called Sevin. There’s also certain aphids that will feed on plants, sucking juices and causing a twisted, distorted growth. Certain insecticides will work or you can implement the use of beneficial wildlife instead. Now, let’s get into some diseases. The most common ones occurs during the heat of summer if it’s also rainy or not watering below the foliage. These are leaf blight diseases, causing leaves to turn brown and then eventually die. The use of fungicides, such as maneb, zineb or benomyl can help plants recover from these fungal diseases. Natural control of diseases include rotating crops, using quality seed and to water below the foliage using soaker hoses. Pickling Cucumbers are harvested small. Remove large cucumbers to make room for small ones. Ideally, cucumber size should be very moderate. Avoid large sized cucumbers as they will be overripe and seedy and undesirable for eating. Not only are cucumber delicious. They are super healthy, too, providing minerals and vitamins to your diet. They are also very low-cal, which is always a plus. Cucumbers are commonly used in a variety of salad dishes or pickled. My personal favorite is to slice cucumbers and toss with some Ranch Dressing. Yum! Here’s another yummy pickle recipe you can use with your homemade pickles. I’ve given you the requirements, tips and tricks for growing great cucumbers. Now, understand that you can grow cucumbers in all kinds of places. Growing cucumbers in pots on your front porch can definitely be possible. If you notice your cucumbers not growing, you might consider the insects or disease issues I talked about. 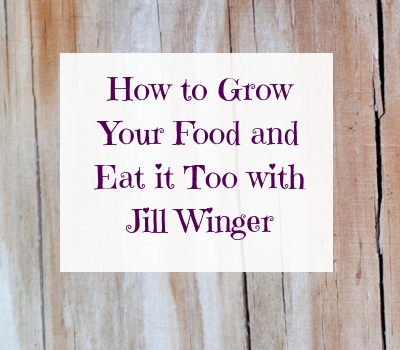 Even the nutrient issues that may need to be met. Growing cucumbers on trellis can help maintain space if you don’t have a lot of it. This is why cucumbers are so versatile and popular for growing wherever you are.